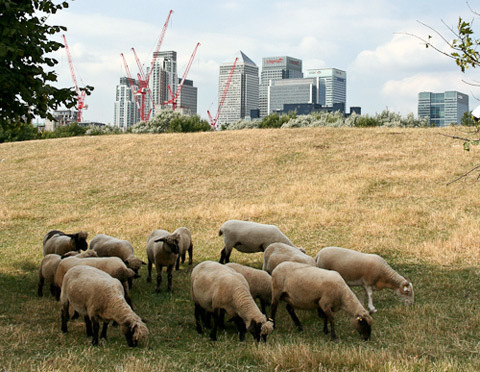 Sheep grazing at Mudchute Farm. For one day only, Savile Row turns ovine: London's poshest and most famous tailoring street will be closed to traffic, turfed over and filled with a flock of brightly-dyed Exmoor Horn and Bowmont sheep. The stunt, officially called Field Day, marks the start of Wool Week, an initiative by the Campaign for Wool which aims to "promote the wonderful properties that wool offers to textiles [and] help to support sheep farming as an industry". Sheep were once common in London's parklands (this photo shows them being driven between Green Park and Hyde Park), though are rarely seen today, aside from events such as the annual sheep driving across London Bridge. It was, however, recently announced that they may be re-introduced on Hampstead Heath, a proposal that some locals have objected to. Baa humbug, say we.